Con Yeager Spice Company has been an all American family owned business for over 75 years. We like them because they use only the best ingredients and package their products so they are ready for use by the weekend butcher. Each kit comes complete with seasonings, cures, casings (when needed) and detailed instructions for processing. 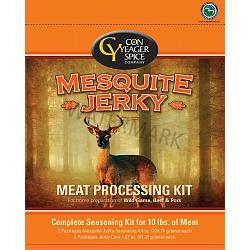 The Mesquite Jerky Kit contains 2 packages of Seasoning and 2 packages of Cure for 10 lbs. of meat (or 2 separate 5 lb batches). Give your venison or beef jerky a real delcious flavor of smoked mesquite hardwood. Made in the USA.